If treated right, hallways can be a very interesting space in anyone’s home. Whether you have an interior cutout that opens into another room, or a mesmerizing spiral staircase, hallways have always been a surprisingly appropriate and interesting place to incorporate our custom stained glass and leaded glass. Staircase windows will often be odd shapes and size, which make them difficult to cover with traditional window applications. They are usually arched at the top, as in our photograph here. Because of their unusual shapes, the options are limited in terms of adding a design feature, covering the glass, and privacy while at the same time allowing the sunlight to come in. 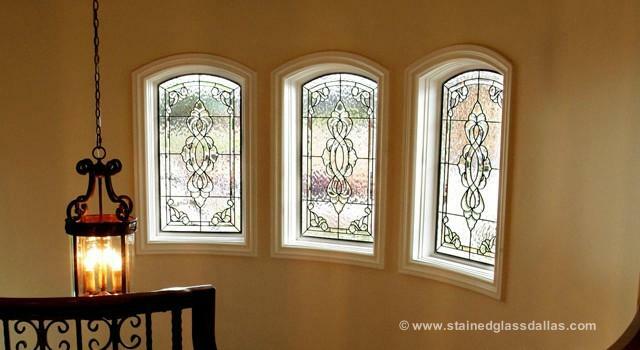 Stained or leaded glass is the only way to accomplish all of these desirable goals at the same time. Our stained glass is not simply beautiful. It is also functional. Plus, windows that are higher up such as in stairwells are difficult to clean. With the textures in our leaded glass pieces, dust will rarely ever be noticeable. When it comes to designing windows for your hallway, the style is completely up to you. Since hallways are typically less decorative than other rooms in your home and lacking in furniture due to spacial restrictions, you have to opportunity to create a stained glass window that is completely unique and does not have any restrictions. Whether you prefer traditional or contemporary designs, stained glass adds the final touch to make this part of your home more interesting. Our stained glass designers are always ready and willing to come to your home. They offer free advice and design suggestions, and will happily show you a variety of colors and textures that are available. Call or email us today to schedule your free consultation.